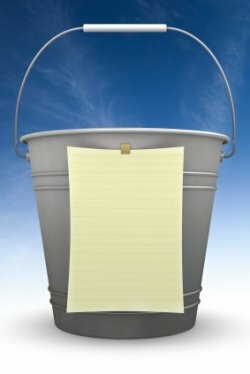 Normally, at SmartPak, we love to talk about what goes in your horse’s bucket, but today we’re talking about what’s on your horsey bucket list (pun very much intended). We asked some SmartPakers and now we want to hear from you! Answer in the comments below or join the conversation on our Facebook wall! Provide a home for unwanted or abused horses to live out their lives. I have two that really stick out for me: #1 competing in the Burghley Horse Trials, and #2 training a big stakes winning Thoroughbred for ourselves or our clients! that’s so cool!! what’s the horses name?? Riding anywhere would be a dream for me. I dream of owning a horse. I love the idea of seeing other countries from the back of a horse . . . Hell, I just want to be around horses. Since I have visited Ireland (love the COnnemaras and Irish draught) that would be in position #1 on my bucket list. The second horsetrek I’d love to make is to ride a PRE in Spain down in Andalusia along the COsta del Sol on the beach! It’s beautiful down near Jerez de la Frontera and the Royal Andalusian School of Equestrian Art is fantastic! I really want to show at pony finals (sadly don’t have a pony), or at least go watch it. I would love to show at wef and hits and vsf, all of those kinds of shows. I dream of having a horse of my own. Also, I really want to go horse shopping in Europe(: and buy a nice warmblood. 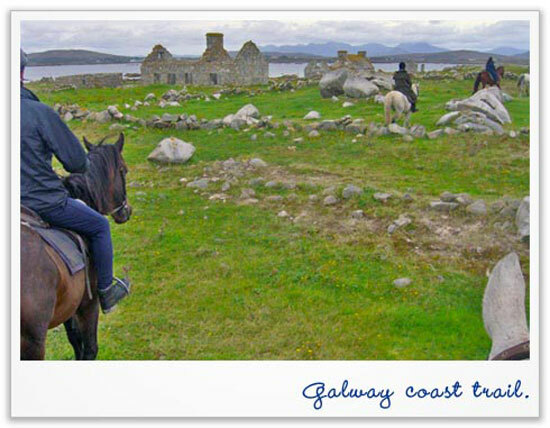 I want so much to go back to Ireland and ride fm castle to castle along the Connemara-Galway coast line! Absolutely gorgeous! My second bucket wish list is to re-visit the Royal Andalusian School in Jerez, Spain and take a classical dressage lesson on a firey PRE! I would also like to visit Austria and do an Equitrek on a Lippizaner fm Vienna to Budapest visiting castles and sleeping in B&Bs like in Ireland!